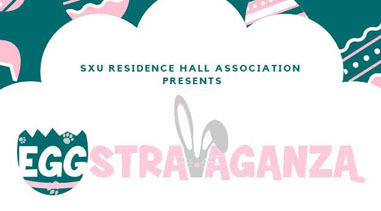 Saint Xavier University (SXU) is excited to announce that the Eggstravaganza Easter Egg Hunt will be held on Sunday, April 28 from 11 a.m. to 1 p.m. at SXU's Deaton Football Field. All neighbors, friends, family and children in the community around Saint Xavier University are invited to attend. Thousands of eggs will be available for children ages one to ten to collect. For older children, music and games -- such as egg, spoon and sack races -- will be part of the festivities. This exciting event is sponsored by the SXU Resident Hall Association and is a collaborative effort between the offices of Residence Life, Campus Ministry and the student organizations of Saint Xavier Council, National Residence Hall Honorary, Service Club and Pals for Change. Bring your families and join us for some free Easter fun! We look forward to seeing you there!